The Cisco Catalyst 3750-X series switches are an enterprise-class line of stackable switches. These switches provide high availability, scalability, security, energy efficiency, and ease of operation with features such as Cisco StackPower, IEEE 802.3at Power over Ethernet Plus (PoE+) configurations, redundant power supplies, and Media Access Control Security (MACsec) features. The Cisco Catalyst 3750-X series with StackWise Plus technology provides scalability, ease of management and investment protection for the evolving business needs. The Cisco Catalyst 3750-X series enhances productivity by enabling applications such as IP telephony, wireless, and video for borderless network experience. Cisco StackWise Plus technology is built on the highly successful industry leading StackWise technology, which is a premium stacking architecture optimized for GbE. StackWise technology was designed to respond to additions, deletions, and redeployment while maintaining constant performance. The stack behaves as a single switching unit that is managed by a master switch elected from one of the member switches. A working stack can accept new members or delete old ones without service interruption. StackWise creates a highly resilient single unified system of up to nine switches, providing simplified management using a single IP address, single telnet session, single command-line interface (CLI), auto-version checking, auto configuration, and more. Cisco StackPower unifies the individual power supplies installed in the switches and creates a pool of power, directing that power where it is needed. Up to four switches can be configured in a StackPower stack with the special connector at the back of the switch using the StackPower cable. The Cisco Catalyst 3750-X series switches offer exceptional security with integrated hardware support for MACsec defined in IEEE 802.1AE. MACsec provides MAC layer encryption over wired networks using out-of-band methods for encryption keying. The MACsec Key Agreement (MKA) protocol provides the required session keys and manages the keys required for encryption when configured. MKA and MACsec are implemented following successful authentication using 802.1x Extensible Authentication Protocol (EAP) framework. Cisco EnergyWise is added to fixed configuration switches, promoting companywide sustainability by reducing energy consumption across an entire corporate infrastructure and affecting more than 50-percent of global greenhouse gas emissions created by worldwide building infrastructure, a much greater effect than the 2-percent generated by the IT industry. Cisco EnergyWise enables companies to measure the power consumption of network infrastructure and network-attached devices and manage power consumption with specific policies, reducing power consumption to realize increased cost savings, potentially affecting any powered device. 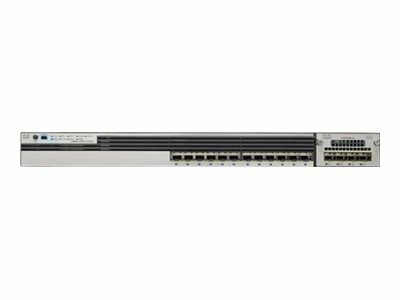 Cisco Catalyst 3750-X series switches, designed and engineered by Cisco, provide optimum power saving, low power operations for industry best-in-class power management, and power consumption capabilities. The Cisco Catalyst 3750-X ports are capable of reduced power modes so that ports not in use can move into a lower power utilization state. StackPower lets customers to simply add one extra power supply in any switch of the stack and provide either power redundancy for any of the stack members or simply add more power to the shared pool. Cisco catalyst smart operations are comprehensive set of capabilities that simplify LAN deployment, configuration, and troubleshooting. In addition to adaptive, always on technologies such as StackWise and StackPower, Cisco catalyst smart operations enable zero touch installation and replacement of switches, fast upgrade, as well as ease of troubleshooting with reduced operational cost. CiscoWorks LAN Management Solution (LMS) is a comprehensive network lifecycle management solution. It provides an extensive library of easy-to-use features to automate the initial and day-to-day management of your Cisco network infrastructure. CiscoWorks LMS uniquely uses Cisco hardware and software platform knowledge and operational experience into a powerful set of work-flow driven configuration, monitoring, troubleshooting, reporting, and administrative tools. Borderless network enables enterprise mobility and business-grade video services. Industry's first unified network (wired and wireless) location services enable tracking of mobile assets and the users of those assets for both wired and wireless devices.